Located on the southern tip of Florida, the city of Miami is famous for its beautiful beaches, glamorous nightlife and buzzing culture. There’s an exciting atmosphere here, with year-round warm weather making it the perfect American beach holiday destination. Miami is home to one of the most renowned beaches in the world, and it’s these warm golden sands that attract millions of sun-worshippers to the city every year. However, it is worth keeping in mind that, if you choose to visit between the months of May and September, you will most likely experience a tropical storm at some point. But Miami is not all about relaxing in the sunshine. There’s a vibrant culture that’s perfect for art lovers, with the Wynwood Walls Art Gallery bringing a splash of colour to the city. Here you can see some exclusive collections, as well as the world-famous Art Basel exhibition. 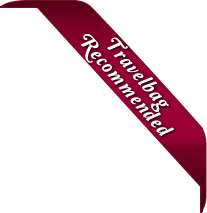 Here at Travelbag, we have over 30 years experience in booking Miami holidays, so you can rest assured that booking with us will be a stress-free experience. Whether it’s flights to Miami or a package deal that you’re looking for, we can help. Take a look through our range of Miami hotels and find the perfect one for you. Miami is one of the most exciting places in the world, so it will come as no surprise that the hotels here reflect the diversity of the city. Whether it’s a cheap Miami hotel you’re after, or something with a little more luxury - we’ve got you covered. 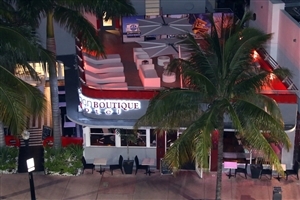 If you’re looking for budget accommodation in Miami, look no further than the Fashion Boutique Hotel. As its name suggests, this hotel features stylish guest rooms that have been inspired by the Art Deco movement of the early 1900s. 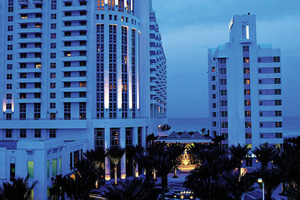 If it’s five-star luxury you’re after, then consider The Tides South Beach hotel. 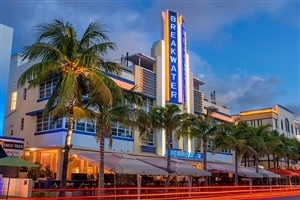 Located right in the heart of Miami’s Art Deco District, this hotel combines lavish guest rooms with lots of idyllic facilities - perfect for your 2019 or 2020 Miami holiday. Jungle Island - Opened in 1936, this park boasts lots of exotic and interesting animals, including parrots, rhinos and giraffes. Coral Castle - This breathtaking stone structure was built in the early twentieth century by Edward Leedskalnin. Leedskalnin claims to have built the castle single handedly, and that he had discovered the secrets of how the Egyptians pyramids were built thousands of years previously. Freedom Tower - This world-famous tower has become a staple of Miami. Museum of Contemporary Art - This large art gallery features many exclusive exhibitions and interesting pieces. However you choose to spend your 2019 or 2020 Miami, you’re bound to find the perfect hotel for you with Travelbag. Here is just a selection of our favourite and cheapest hotels in Miami. Please use our search panel above to find your perfect choice. 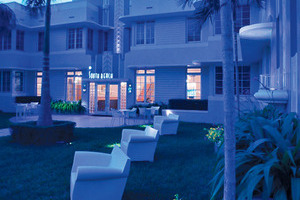 The boutique Pestana South Beach Art Deco Hotel consists of four separate buildings each intricately designed with comfort and style in mind to compliment the beauty and vibrancy found peppered across the gorgeous landscape of Miami’s own South Beach District. The financial centre of Latin America, Miami, is the perfect ... place for travellers to ease back and enjoy the glorious sunshine, crystal clear waters and elegant promenades, or for those looking for something a touch more commercial, the Miami Beach Convention Centre and open-air shopping centre of Lincoln Road sits only a few minutes away. The hotel itself is ideal for travellers to end the day in, featuring a wide amount of amenities, a fantastic dining venue and 97 rooms and suites all designed with the utmost care and consideration to ensure a satisfactory stay that both business and leisure travellers are sure to remember forever. Settled directly on Ocean Drive deep in the heart of the Art Deco District in glorious South Beach, the Ocean Five Hotel serves as a warm and welcoming boutique hotel that presents visitors with the great opportunity to indulge in the sights and sounds of one of Miami’s most renowned ... settings. Located close to many of the areas shopping outlets, dining venues and nightlife hotspots as well as the golden sanded beaches that makes this area so special, the hotel is a great choice for avid explorers to immerse themselves in the vibrancy of Miami, while the hotel itself is filled out with its very own in-house dining venue and 81 lavishly designed accommodations to choose from, all offering an authentic piece of the South Beach lifestyle. Located at the intersection of 10th Street and Ocean Drive deep in the heart of Miami sits the Esplendor Breakwater South Beach, a stylish, modern hotel that serves as an idyllic getaway for business and leisure travellers looking for an abundance of luxury and an attentive level of service during ... their time spent in Miami Beach’s illustrious Art Deco district. 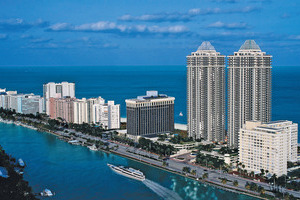 Benefitting from such a central setting, guests will find their time exploring the surrounding area a real treat, with plenty of local landmarks, entertainment outlets, shopping venues and pristine beaches set along Ocean Drive just waiting to be found as well as plenty of nightlife hotspots come evening time, there’s something for everyone to be found within the vibrant city of Miami. The hotel itself hosts plenty of soothing and recreational facilities within its comfortable confines and along with the in-house eateries and 99 lavish accommodations sets the tone for what is sure to be an unforgettable urban paradise for visitors to enjoy. Bringing together a combination of luxury, style, fun and sophistication, the Nobu Hotel Miami Beach serves as an idyllic getaway for those looking to bask beneath the Florida sun. Designed with Japanese beach-house influences, guests are in for a soothing treat with the plush-filled rooms, suites and villas while the ... in-house dining venues are sure to tempt the palates of even the most discerning visitors. Whether you're looking to explore the city of Miami or simply settle back into a world of luxury, the Nobu Hotel is the place for you. Bringing comfort and convenience to travellers looking to get the most out of their stay in North Miami, the Collins Hotel invites guests to ease back and bask beneath the Florida sun either within the stylish confines of the hotel itself or on the nearby sands of North Beach. Filled ... to the brim with modern amenities and spacious settings, the hotel serves as a great place for family adventurers or romantic couples to take in some sun, surf and sand, while the top restaurants, shopping outlets and entertainment hotspots are all situated close by, waiting to be discovered. Alternatively, the hotel itself houses several soothing facilities for guests to utilise, and when coupled with the contemporary accommodations, this is a prime Miami getaway for one and all. Consisting of 34 floors of unadulterated luxury, the Conrad Miami by Hilton is a modern haven that deservedly shares a place with other iconic landmarks that make up the gorgeous downtown city skyline, serving as a beacon of true urban comfort to attract travellers the world over to embrace the ... hotel’s distinct minimalist designs, stylish settings and an attentive level of service that only serves to enhance any Miami holiday. 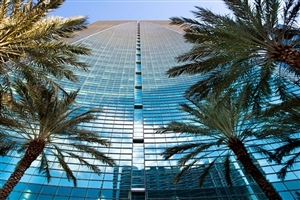 Situated downtown, the hotel provides easy access to various nearby highlights such as stunning South Beach, the Miami Beach Convention Center and the Port of Miami Cruise terminal, all waiting to be discovered by avid explorers, while the sophisticated confines of the hotel serve as the perfect place to start and end each day, with an array of soothing and recreational facilities to utilise, in-house dining venues to visit and a range of plush-filled accommodations to choose from, all coming together to provide a world class experience that won’t soon be forgotten. Ideally set within the heart of Miami’s renowned Art Deco District, the Crest Hotel Suites is an award winning boutique getaway where travellers can ease back and soak up the vibrancy of one of Florida’s most prominent settings while revelling in a world of comfort and style. 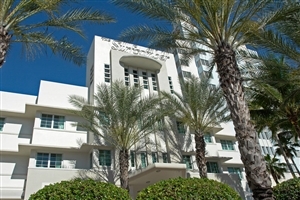 Situated in close ... proximity to a number of local landmarks, the hotel presents explorers with the opportunity to immerse themselves in the ambiance of the city and discover such highlights as Lincoln Road Mall, Ocean Drive, the Miami Beach Convention Centre and the Collins Park Cultural Campus to name but a few. The hotel itself serves as a great place for those simply seeking to relax, with an attentive level of service complimenting the numerous facilities, in-house dining venue and each of the lavishly designed accommodations that set the tone for an unforgettable Miami holiday. Relish in the elegant ambiance of Miami’s own Fashion Boutique Hotel, a city getaway whose distinct designs are inspired by the renowned Art Deco movement of the early 1900s and the influential fashion scene of Miami Beach. Boasting plenty of spacious settings, modern amenities and an air of sophistication throughout, ... the hotel is a great place for business and leisure travellers to experience great levels of comfort while also being able to access some of the highlights of Miami’s Art Deco district as well as the beaches and entertainment outlets that make this such a hotspot. With 48 lavishly fitted suites to choose from and so much to discover around the hotel, a memorable occasion is all but guaranteed at this magnificent Miami retreat. Bringing the glitz and glamour of Miami Beach closer than ever before, the Fontainebleau Miami Beach is a fantastic resort where unforgettable views of the Atlantic Ocean are the tip of the iceberg awaiting visitors. Boasting generously spacious settings, stylish designs and an attentive level of service, the resort treats ... its many guests to everything a discerning traveller could need, presenting easy access to the beaches and entertainment outlets dotted around the area, with things to do during the day and night just waiting to be discovered. Housing a number of soothing and recreational facilities, plenty of in-house dining venues and a total of 1,504 intricately designed accommodations to choose from, the resort is a great option for those seeking something special for their Miami getaway. 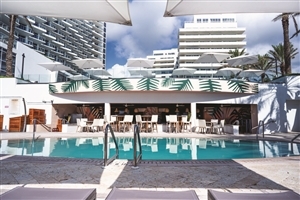 Set deep in the heart of the tropical paradise that is South Beach, the Loews Miami Beach Hotel invites family adventurers, romantic couples and business travellers to indulge in the vibrancy and cosmopolitan ambiance of one of Miami’s hottest locations. Providing direct access to the natural splendour of the ocean ... as well as the dining venues, entertainment outlets and iconic landmarks peppered across the city, travellers can make the most of their time at the hotel by venturing out and discovering the highlights of the sun-bathed city or simply ease back and relax within the lavish confines of the hotel and be treated to spacious settings, plush furnishings and an attentive level of service. Boasting a number of soothing and recreational facilities, several in-house dining choices and a total of 790 accommodations, the hotel brings together all the necessary elements for the perfect holiday. The uniquely elegant Miami Beach Resort & Spa sits nestled among the vibrant wonders of “Magic City”, looking out over the glamour and beauty of South Beach, bathed in the Florida sunshine and blessed with a warm sea breeze. Set amidst the golden sanded beaches and azure waters of Miami ... Beach, the hotel combines tranquil views and a lively ambiance with modern comforts and a keen sense of style as seen throughout the various dining venues, facilities and each of the 424 lavishly furnished guestrooms and suites, all individually designed to ensure guest satisfaction and encourage a blissful experience. So whether guests wish to bask in the exotic atmosphere of the hotel or explore the stretch of sand outside they are bound to be impressed with such a magnificent location. 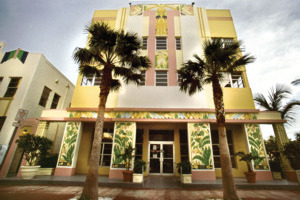 Blending in beautifully with its stylish Art Deco designs, the South Beach Hotel welcomes business and leisure travellers to the heart of South Beach’s Collins Park, a great location where the many sights and sounds of Miami can be enjoyed. 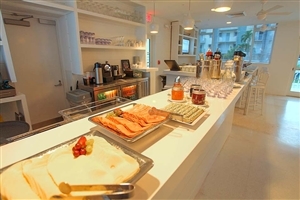 The hotel is located within walking distance to such local ... landmarks as the Miami Beach Convention Centre and the magnificent ocean setting that the area is so renowned for, making this a perfect place for those looking to explore and uncover the nuances of South Beach. 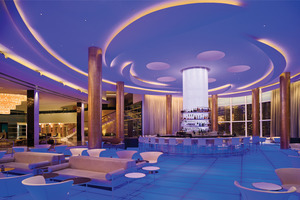 Designed with a sense of chic vibrancy, the hotel presents an abundance of space to accompany an attentive level of service, and with an array of facilities on hand, in-house dining venues and various guestrooms and suites to choose from, visitors the world over can expect a great occasion in “The Magic City”. 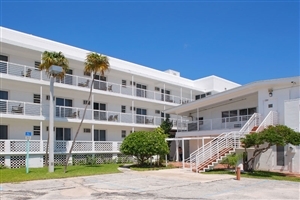 The Surfcomber Miami serves as a boutique retreat that embraces the free spirited nature of Miami’s South Beach region where sunny beaches and swaying cabana’s wait to welcome you to this Floridian haven. Guests will find themselves surrounded on all sides by a plethora of visual pleasures during their stay ... at this utopian hotel, with the in-house facilities ranging from the fun and thrilling to the soothing and rejuvenating while the exterior treats lie in the local hotspots spread throughout South Beach and lead all the way to the ebbing waves of the Atlantic Ocean. Whether for relaxation or exploration purposes, the Surfcomber is the perfect place for a most memorable American experience. 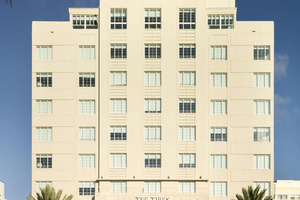 Located deep amongst the vibrancy of Miami’s Art Deco District, The Tides South Beach is a warm and welcoming getaway that invites guests the world over to indulge in the gorgeous sights and unforgettable sounds of South Beach while being treated to spacious settings, modern comforts and a world-class level ... of service. Situated in close proximity to the many restaurants, entertainment hotspots and shopping outlets throughout the city, the hotel serves as a great place for avid explorers to uncover the nuances of this bustling region, while the in-house amenities, dining venue and each of the 45 lavish accommodations come together with stunning vistas to create an oasis of style that is sure to appeal to everyone.